ISLAMABAD, Pakistan (CNN) -- A key transit link for NATO and U.S. military supplies into Afghanistan is expected to reopen in the next two days, a Pakistani military official told CNN Wednesday. 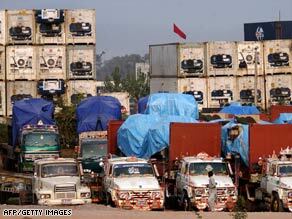 Containers bearing supplies for US-led forces and NATO in Afghanistan pass through Pakistan. The supply routes in the Khyber Pass were closed on Tuesday after Pakistani forces launched an operation against Taliban militants in the country's tribal regions, Pakistani military sources said. NATO and U.S. military supplies were being re-routed, mostly air-lifted, the sources said. The operation is an attempt to halt militant attacks on NATO supply trucks, and recent attacks on several girls' schools in the Khyber region. The Khyber Pass -- an ancient, three-mile pass which links Pakistan to Afghanistan through the Hindu Kush mountain range -- has traditionally been a vital route into Afghanistan. Eight people -- two suspected Taliban militants and six civilians -- died in Tuesday's fighting which involved military helicopter gunships, according to Pakistani intelligence sources. The fighting took place near the town of Jamrud. The U.S. military praised Pakistan's incursion. "We are pleased with the operation to clear out insurgent in the areas adjacent to the pass so our supplies can go unhindered," U.S. forces in Afghanistan said in a released statement. "This temporary delay will result in the long-term gains for all that use that passage route. There is no immediate impact in our ability to provide supplies to the troops." NATO countries are working on plans with countries in the north -- including Azerbaijan, Turkmenistan and Uzbekistan -- for possible new supply routes. Earlier this month, suspected Taliban militants attacked cargo terminals in Peshawar, Pakistan -- which sits along the transit route -- destroying NATO military vehicles carrying supplies bound for Afghanistan, Peshawar police said. It followed at least five other attacks against NATO and U.S. supply lines in previous weeks. Last month, Pakistani officials suspended travel through the mountain pass, citing security concerns. They reversed their decision a day later.